Three adjectives that describe you: Loud, hilarious, and unpredictable. Favorite activities: Anything where I can have fun and laugh. That's anywhere from a comedy club to an amusement park full of rollercoaster rides. Being away from my daughter. I spend so much time with my daughter, so to leave her for three months is going to be hell, but I have to remember this is all for her. Danielle Reyes [from Seasons 3 and 7] because she had the game in the palm of her hand. 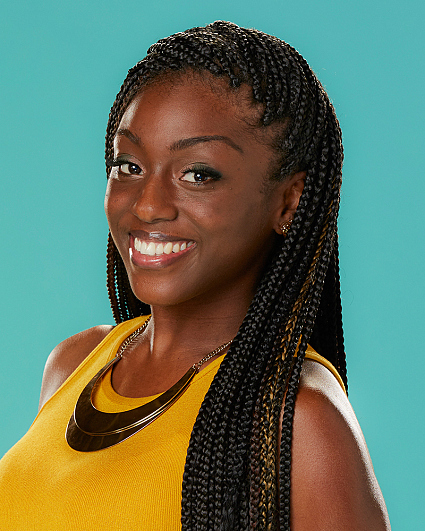 She was very smart, very strategic, and I feel like she was definitely robbed of the win during her season. Yes, in the first couple of weeks, I want to focus more on my social game and build relationships with people. Then, my goal is do whatever I have to do to gain protection and numbers, and then, at the perfect time, get real cutthroat and take [the other Houseguests] down one by one. My Bible to help control my attitude, one of my daughter's blankets or stuffed animals to keep me focused, and sunglasses so I can easily read people's lips when they try to sneak game talk.